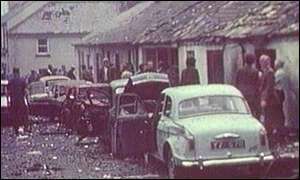 It's 40 years to the day since the bombing of Claudy in County Derry in which 9 people were killed. The method of attack -- multiple bombs in different locations in a compact village -- make it a precursor to similar and larger attacks in Ireland and elsewhere later. No one has ever been charged with the attack. The anniversary was the lead story on BBC Northern Ireland lunchtime news. On the equivalent broadcast of RTE -- the all-economic-crisis-all-the-time outlet -- it doesn't rate a mention. 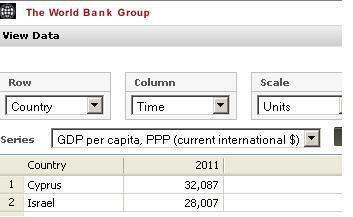 Cyprus and Israel are so close geographically yet Cyprus is significantly richer. Over to you, Mitt Romney. RTE -- The Olympic Council of Ireland is investigating an allegation that an Irish competitor at the London Games previously bet on an opponent to win an event in which they were both competing. A spokesman said the council has informed the athlete, whom it will not name, about an anonymous allegation that two bets were made in favour of an opponent in an unspecified sport prior to the Olympics. Note: Ireland's sporting administrative elite could use a dose of humility. BBC -- Olympic organisers are investigating why many seats were empty during events at venues including the Aquatic Centre in east London. The BBC's Nick Hope said areas high in the stands at the sold-out event were full but several hundred more expensive seats lower down were not filled. Locog said some accredited seats - for press and media - were empty. Now, with stock markets dropping, you know 10%, 10%, this is people's pensions and things. You know we saw the thing with the Iceland, well. The UK banks, well the UK savers in Iceland, that, that crystallises people's thoughts, and so I think that we're sort of reaching a new stage in the game whereby the CPFF is really good but, not sure it goes far enough, it just gets you back to where you were in August ... So, I think, getting us back to where we were in August isn't really, is, don't get me wrong, it's incredibly useful, but I'm just wondering whether we need to be got back to August plus a bit. The UK guarantee to banks, again, it's a very, very positive thing but, a bit like the CPFF, no-one really knows the details, it's going to take several weeks to get off the ground, everyone is going to examine the guarantee and it's going to take a bit of time for things to start working there. So, again, that's sort of work-in-progress but that is very good news but... you know, the rumour came out that, you know, G8 were going to guarantee all bank deposits, and, you know that's ... What I think, and I know central banks don't like doing this, my view is that, everyone's talking about, "You've got to get into bank lending happening again." I don't think that's necessarily the important thing. I think the important thing is to get banks lending to the consumer ... to Joe Public so I think the way you do that, is you either do things like increase CPFF or you just um, do something similar, like just buying bank term CDs ... But I know central banks don't like doing that. But it's getting to the stage where everytime you and I think you guys tried to be ahead of the curve in the States, er everytime you throw the kitchen sink at the problem, it needs another sink and then another sink. Then there's euphoria for half a day then something else happens and the market plunges, something else has to happen, the the market plunges. It's almost as if, you know, you've got to be totally radical now ... Ahh, because otherwise I had a fit of pessimism a couple of days ago. I think it was the day after RBS got downgraded when there was mayhem in the market and urn I was thinking, you know, this is potential civil strife here because the banking system is just going to break down. The Barclays employee understood better than his superiors or regulators what a perilous phase the financial sector was at in terms not just of its own crisis, but of its perception with the public. But somehow the backlash didn't happen till 4 years later. But the accumulating disdain could not be put off forever. Much like the more specific LIBOR concerns, it's not clear what the people in the trading rooms knew was travelling upstairs. ... the Central Bank of Bahrain received a letter on 19 June 2012 from the US Government requesting the entry of the money in order to pay the salaries of US servicemen stationed in Bahrain and other locations in the Gulf ... 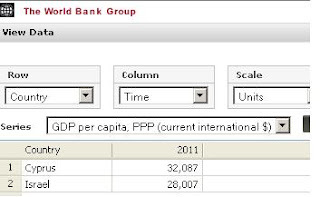 Typically, such amounts enter Bahrain through an authorized money exchange office. On 12 July 2012, the American Embassy still had not received approval for the entry of the money. Embassy officials contacted the Foreign Ministry to notify them that the money was scheduled to arrive on a military airplane that was to land in an allocated military zone at the Bahrain International Airport.When the carriers of the money arrived they notified customs officials that they were carrying $11 million. The customs officials asked them to provide all of the documents and identifications related to the transfer. The money was held by the customs agents until entry approval was obtained by the Foreign Ministry. Once approval was received and all proper procedures had been followed, the money was released to the carriers. Well, OK, but ... Bahrain has banks and currency exchanges and its currency is pegged to the dollar so it's not like there's some difficulty in wiring $11 million to the country. So why the need for cash? Lots of it. In the Gulf. A hop, skip, and jump from Iran and pirates and al Qaeda and all sorts of other stuff. Mitt Romney is strangely insistent that he had no active management role in Bain Capital after 1999. Mitt Romney is strangely insistent that no one is getting to see his tax returns prior to 2010. Even though the former date is associated with the row about Bain Capital's job creation numbers, it would be irresponsible not to speculate that there is a close link between the Bain Capital departure date and the reticence about taxes. Specifically: did Mitt pay self-employment tax on his Bain Capital income after 1999? If he was claiming to be a passive owner, as apparently he was, he wasn't liable for this tax. But any inkling that he still had an operational role in the firm would be tricky. By Mitt's standards, it's not even that much money given the cap on social security taxes. But it would be embarrassing for a party beholden to the cult of the entrepreneur to have its standard bearer someone who dodged a specific tax on that group. Incidentally, there have been issues before with Mitt's exact knowledge of this tax. I [Barclays trader] think people are afraid to be seen as being having, I mean if they have a high libor the market automatically assumes they're paying too much, but in a perverse kind of way if you put a low libor, it's almost as if the market knows that you're scared to put where you really think it is. I mean, I know that I'm consistently high, but I think I'm consistently correct. The problem is that today’s meritocratic elites cannot admit to themselves that they are elites. Everybody thinks they are countercultural rebels, insurgents against the true establishment, which is always somewhere else. "Is there a V.I.P. entrance? We are V.I.P." That remark, by a donor waiting to get in to one of Mitt Romney’s recent fund-raisers in the Hamptons, pretty much sums up the attitude of America’s wealthy elite. Saudi Customs authorities displaying bottles of what looks like whisky that were hidden inside seemingly new tires. Photo via Saudi Press Agency. As a service to humankind, this blog is making available at no charge to everyone an argument that will save hundreds of millions of pounds in legal and consulting fees concerning the LIBOR rigging scandal. This argument required countless hours to develop and involved the use of highly sophisticated computer technology, as seen in the diagram above. Yet through the use of advanced concepts not unrelated to those used to search for the Higgs boson, we have conclusively shown that the alleged rigging of reported LIBOR by the various banks was irrelevant. The logic is as follows. Everyone says that the scandal comes from the fact that the interest rates in other loan markets were set as LIBOR plus a spread, therefore if LIBOR was understated or overstated, the rates in those other markets must have been affected as well. Picking one hypothetical other market, let i stand for the interest rate in that market, L the quantity of loans, S the supply of loans, and D the demand for loans. Through the miracle of economics, that market has an equilibrium interest rate and quantity of loans denoted i* and L*. Now here's the thing: you can break up that i* into any sets of numbers that add up to it, but through the aforementioned miracle of economics, there's only one interest that brings about equilibrium in that market. Unless you've got some reason why the process for reporting LIBOR affected S and D, there's no reason why the interest rate should have changed. 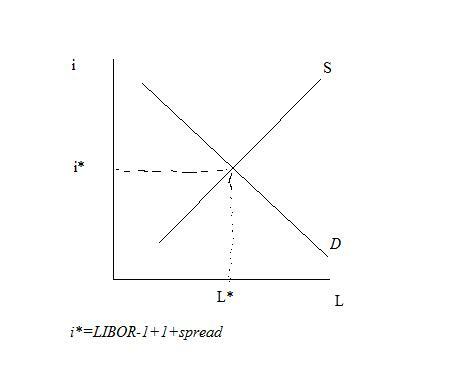 So if LIBOR was off by 1 percentage point, then somewhere along the chain the equilibrium will involve adding 1 percent to keep the market where it was before, as illustrated by our highly complex equation below the diagram which relies on the deep mathematical property that 1-1=0. OK, do we actually believe this? We're not sure, but it would advance the argument if this was taken as the baseline position. Would the Republic of Ireland participate in a Tory referendum on UK EU membership? Could not the Irish government argue that a referendum on the question of Northern Ireland leaving the EU with the UK has outcomes so inimical to a united Ireland that under the treaty, the Republic would have to be consulted through an all-Ireland referendum on the question? Everyone has their theories and interpretations about why United States Supreme Court Chief Justice John Roberts voted to uphold the Affordable Care Act, aka ObamneyCare. Here's another. After he was appointed to the court, he was diagnosed with epilepsy. He'd had a seizure years ago and then had another one during his term. Long medical story short, 2 seizures = epilepsy. As a result, he may have had time to contemplate what life is like outside a well-regulated public sector health insurance plan for those with pre-existing conditions. An epilepsy diagnosis can pose big problems in the private insurance market. That's a much more plausible theory than the one about his medicine being the problem.